If there’s one word to sum up the career of Stafford Meals on Wheels branch President and volunteer extraordinaire Jack Pool, it would have to be EMPATHY written in very large letters. For 20 years, the 86-year-old Jack has served Meals on Wheels in various roles and has been its hands-on president for the last 15 of those. It’s a remarkable record but, as I discovered chatting to him over coffee recently, it’s just one episode in a life of service. That began for him some 76 years ago when, at the age of 10, he had a nervous breakdown and temporarily lost control of his limbs. He recovered but never forgot how helpless he had felt and, in typical fashion, joined the Junior Red Cross and became active in helping handicapped children. This was a start of a life-long interest in helping those unable to help themselves, whether they be handicapped, aged or infirm. 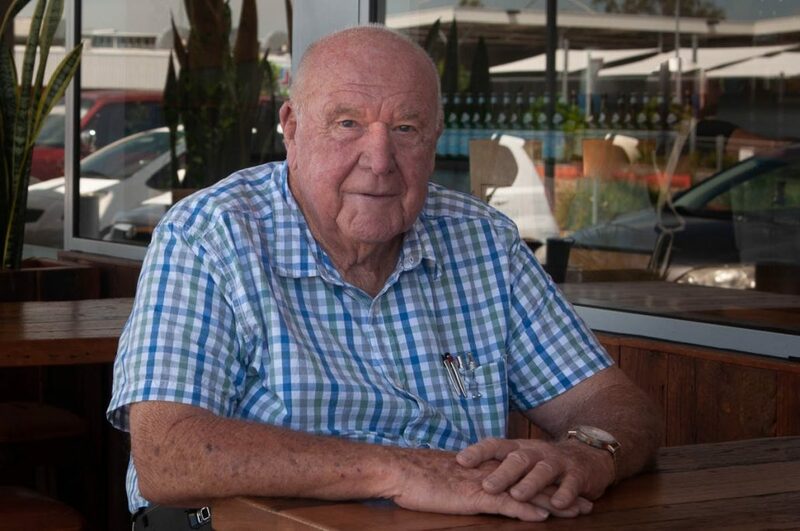 He has been on more voluntary committees and given more motivational talks to groups, including the Queensland Police, than he can easily remember. Highlights include transporting people to hospital and doctors’ appointments with St John’s Ambulance and stints on the committees of Northern Suburbs Aged Care, Stafford Community Forum and the Refugee Committee at Chermside. He was also People’s Warden at St Clements Anglican Church for 10 years, treasurer for 5 of them and a liturgical assistant. Jack is a person who not only has the volunteer spirit but also the gift of getting things done and motivating teams of people to move in the same direction. He learned many important lessons in his career in the paint industry which he applied in his voluntary activities. He found himself in charge of teams of much older men while still a 17-year-old apprentice painter and had to develop a management style that would achieve the required result without antagonising the old hands. And the method? Good communication, listening to everyone and making them feel their opinions counted. He did occasionally forget that but learned an important lesson one day when he was painting the front fence of house and a stranger walked past and pointed out where he was going wrong. Jack was already pretty good at listening but he ignored that advice which, it turned out, could have saved him a lot of effort. He never forgot again. Less than a week after retiring from the paint industry Jack fronted up as a volunteer at Stafford Meals on Wheels and is still there today. As president of the branch for 15 years, he is no ceremonial figurehead, but an active participant in the day-to-day life of the organisation. 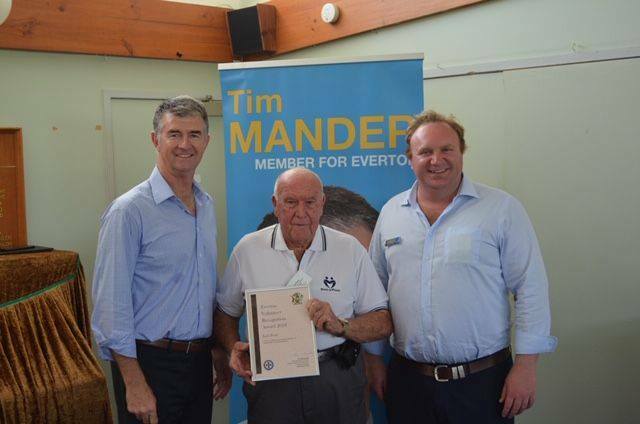 Jack receiving the award for Everton Park Volunteer of the Year from Tim Mander. As far as Jack is concerned, leaving his clients waiting for their meals is not an option and he will load up his car with scrumptious meals and head off to deliver them if necessary. He is very aware his clients not only rely on Stafford Meals on Wheels to keep themselves fed, but also that the daily interaction they have with the Meals on Wheels volunteers is often the only contact they have outside their homes. These visits can literally mean the difference between life and death as happened recently when a client seriously injured themselves in a fall overnight. The volunteer alerted the office in Stafford who summoned the emergency services and got the client to hospital. Jack is also very involved with fund-raising and is the mastermind behind the regular Meals on Wheels sausage sizzles at the local Bunnings. He is also very talented at procuring raffle prizes from local businesses and well-wishers. He often spends the whole day behind a table at Stafford Centre or outside Rode Meats drumming up community support and soliciting donations. He is active in community groups including the NOW Business Network where he sits on the fundraising committee and assists them with their fundraising efforts. Meet people face-to-face if at all possible. It builds relationships in ways that emails and the phone never can. He gave a cheeky grin and said it also makes it much harder for people to ignore requests to donate prizes for prizes for your raffles.